Researching and purchasing apparel on mobile has come into fashion—and it's sure to last through this season and many more to come. Here's the latest research on what your business can do to meet shoppers in the mobile moments that matter. For most Australians, the path to purchase for apparel and accessories is pretty short. Shoppers decide they need a new item, conduct research, and head to the store (or seal the deal online). Sixty percent of research is done on the same day as purchase.1 This means shoppers make a lot of quick decisions on mobile, as they gather ideas, research products, and search for local information. Businesses can be there to influence them in these intent-rich micro-moments. To understand what this quick purchase journey looks like, Google teamed up with market research firm TNS Australia and conducted quantitative and qualitative research. 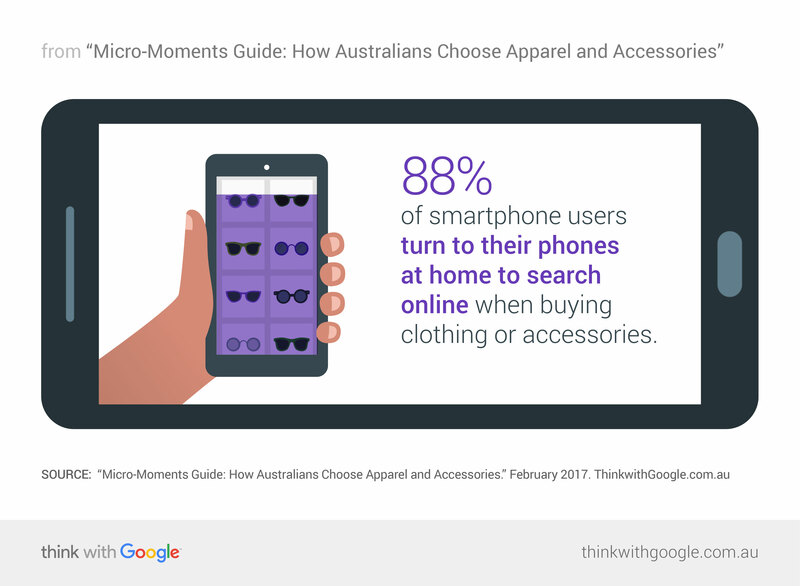 We dove into how and when Australian shoppers use mobile to find and choose apparel and accessories. Most apparel purchases are spontaneous. A flash of inspiration can happen when someone spots a beautiful jacket while walking to lunch—or a moment of need can crop up when those beloved jeans finally give out. When the need arises, many Australians turn to their smartphones. Their first questions? "What's in?" and, maybe more importantly, "What's out?" Checking trends helps them build a frame of reference and shortcut the research process. Ensure that you show up: To be in the consideration set, your business needs to be there not only when people search for your business specifically but also when they search category terms related to the items you sell. If you sell a wide variety of swimwear, for example, you should be there when people search for "swimsuits," "swim shorts," "bathing suits," and "bikinis." Create inspiring content: Help shoppers stay informed about the latest styles and trends by creating style guides or seasonal YouTube videos. Forty-five percent of smartphone users first learnt about a product by looking on a website or app,3 so look to improve your search and filter functionality and allow for maximum product discoverability. These moments give retailers a chance to show off what they've got. And it's all about the photos and videos. Shoppers want to see the items from every angle: how they fit, what they can be paired with, and what they look like when they move. Feature product reviews: Make it easy for shoppers to choose you by showcasing reviews from other satisfied shoppers. Show product availability: As much as shoppers care about optimisation and finding the perfect piece, they care equally about being efficient and saving time. Show them whether an item is available or not. Consumers continue to rely on their smartphones all the way to checkout, as 82% of U.S. shoppers say they consult their phones on purchase they're about to make in a store.8 Even when shoppers know what they want, they'll often look up reviews and even other products from the dressing room or checkout line. Retailers that embrace this and provide quick, helpful information tailored for in-store shoppers can help them feel more confident in their purchases—and can use the opportunity to suggest other apparel or accessories. Show local availability: On your site, include functionality that shows shoppers what items are available at which stores. To drive shoppers directly to you, show product availability at your different store locations with local inventory ads. Speed it up: A fast and mobile-friendly site with a simple checkout process will foster confidence in shoppers to purchase straight from their smartphones. Run a quick check on how fast your site is right now with Test My Site. Ask yourself: Are you prepared to meet Australian shoppers in the moments that matter most? Take time to think about what mobile searchers may be looking for at every micro-moment—and how you can help them find the perfect look. Google partnered with TNS Australia in October 2016 to conduct qualitative research with n=30 18–54-year-olds across Australia on how consumers research, shop for, and purchase a range of categories. This research supports a variety of other quantitative studies (sourced below) in order to gain a deep understanding of category specific micro-moments. 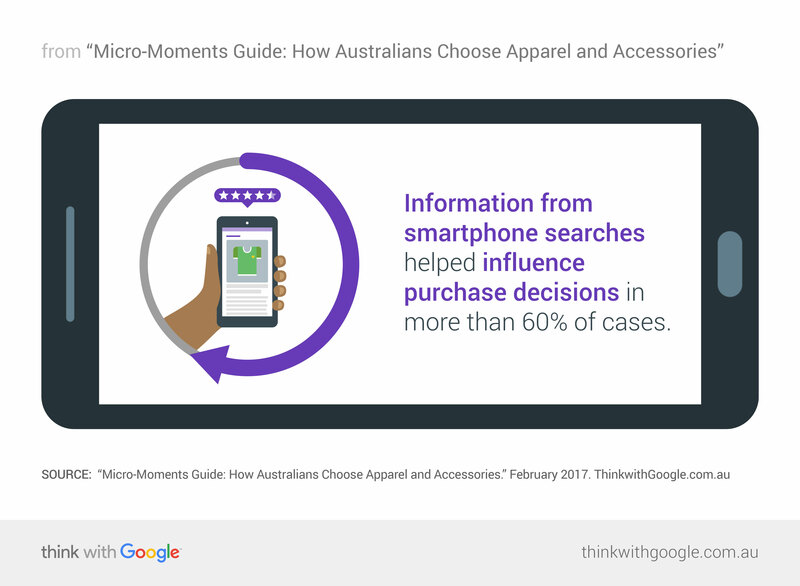 1 Google/TNS, "The Consumer Barometer Survey," 2015, Australia, n=335 internet users answering based on a recent apparel purchase. 2 Google/Ipsos, "Consumers in the Micro-Moment, Wave 3," August 2015, U.S., n=1,291 online smartphone users aged 18+. 3 Google/Galaxy, "Consumers in the Micro-Moment," June 2015, Australia, n=351 smartphone users. 4 Google/TNS, "The Consumer Barometer Survey," 2015, Australia, n=335 internet users answering based on a recent apparel purchase, n=108 made their purchase online. 5 Google/Ipsos Connect, "How Images Influence Mobile Shoppers, Phase 2," June 2016, U.S., n=551 mobile women's apparel shoppers. 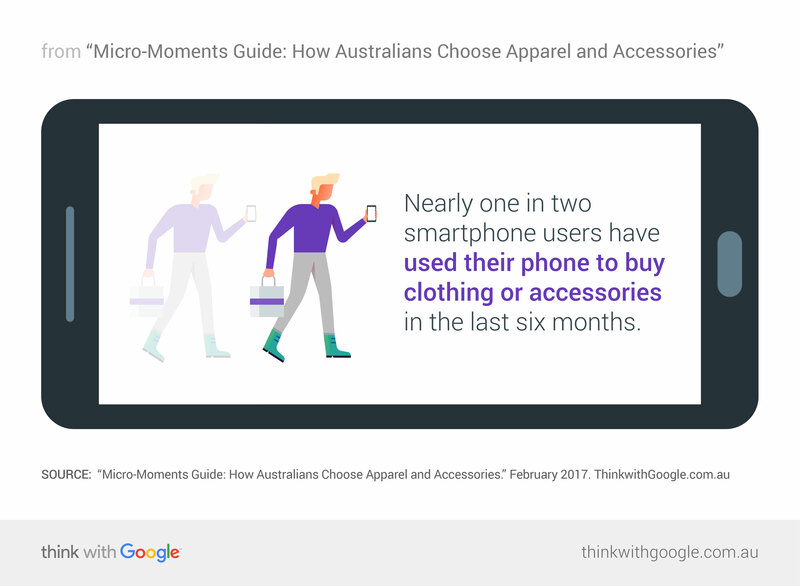 6 Google/Galaxy, "Consumers in the Micro-Moment," June 2015, Australia, n=1002 smartphone users. 7 Google/Purchased Digital Diary, "How Consumers Solve Their Needs in the Moment," May 2016, U.S., n=1,000 smartphone users, n=634 local searchers. 8 Google/Ipsos, "Consumers in the Micro-Moment," U.S., March 2015, n=5,398 internet users. 9 eMarketer, "eCommerce Survey 2014," October 2014.